I’ve been tipped about two separate projects launched on Indiegogo and Kickstarter that integrate Raspberry Pi or ODROID boards into their products. indieGO! retro gaming console and distribution leverages Raspberry Pi 2, ODROID-C1+, or ODROID-XU4 to play older games, while Pi2Media HT1 relies on either Raspberry Pi2, and later the upcoming UP Board or ODROID-C2 boards in order to offer a Surround 7.1 Home Theater PC. Beside the development board, indieGo! also includes a DVD-RW drive, an SD card reader, a mini-ITX case, a 3D-Printed I/O-shield and ARM board holder, a USB joypad, and two USB ports. 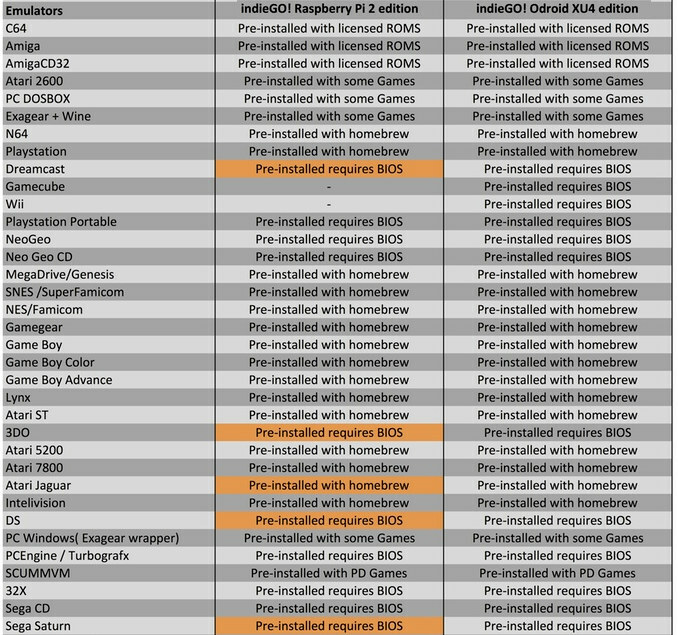 indieGO!-OS is also a Linux distribution based on AEROS running Exagear which means both ARM (native) and x86 (emulation) executables will run on the device. Pre-isntalled programs include Wine, Kodi, Moonlight, AmiCloud, and EmuLA. The many emulators installed allow support for games running Playstation, C64, Dreamcast, Game Boy, Atari, Sega, PC, etc..
Emulators highlighted in Orange will run with lag, so for a better experience, you’d have to select ODROID-XU4. indieGO! project is currently on Kickstarter with less than 48 hours to go, and fully funded with over 60,000 Euros. If you don’t need the hardware, but would like to run the distribution on your development board, you can pledge 25 or 29 Euros to get a download link to indieGO!-OS for respectively Raspberry Pi 2, or ODROID boards. A 99 Euros pledge will get your the OS, and the complete hardware minus the board, and if you want a complete system, you’ll need 149 Euros + shipping for a Raspberry Pi 2 system, or 199 Euros for the version with ODROID-XU4 board. Delivery is scheduled for June 2016. The device will be pre-loaded with Open Source Media Center (OSMC), but you can of course run other Linux distributions available for Raspberry Pi 2. 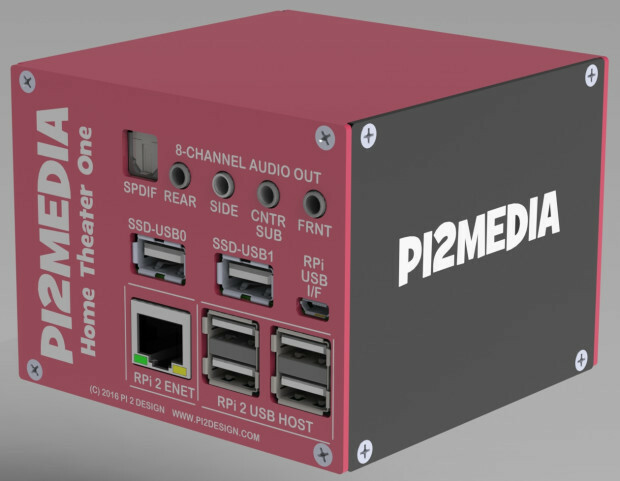 Pi2Media HT1 has recently been launched on Indiegogo (flexible funding), where the company aims to raise $30,000. If you already own a Raspberry Pi 2, you can get all remaining hardware by pledging $179 for the DIY Bundle 2 kit with the two add-on boards, aluminum enclosure, the power supply, and all necessary cables and mountings. 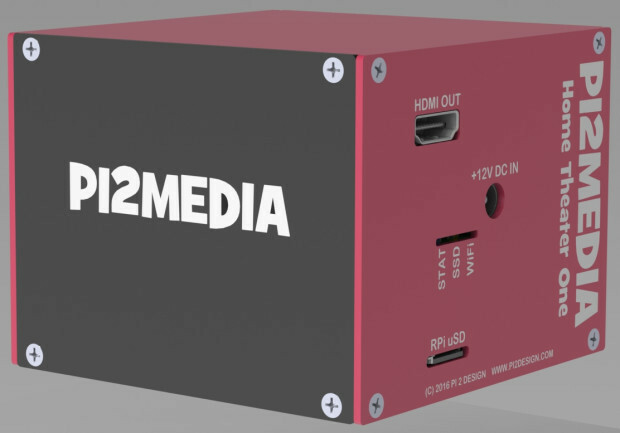 A complete Pi2Media HT1 with a 32GB goes for $249, while you’re being asking for $439 the version with a 500 GB SSD. Shipping is included, and delivery is scheduled for May 2016. They combine leftover add-on modules that they will go scrap and they want to sell them for gold and people is stupid and will bite…nah! The add on modules are production modules they sell. Not sure what you mean about scrap? Scrap=obsolete=trashbin=useless for the majority of people.